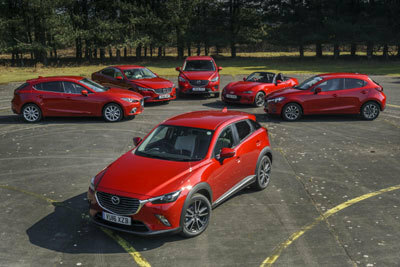 Having recorded a 22 per cent year-on-year rise in fleet sales in 2015, which at more than 19,000 represented a seven-year high, Mazda arrived at the influential Fleet Show with an award-winning range and record sales. At the Show, fleet chiefs were able to drive key corporate models from the Mazda3, Mazda6, all-new Mazda CX-3 and Mazda CX-5 ranges, plus experience the World Car of the Year winning, all-new Mazda MX-5. The Mazda6 remains Mazda’s fleet favourite, but the brand is reporting strong interest among user-chooser company car drivers for both the all-new Mazda CX-3 and Mazda CX-5 sports utility vehicles, while demand for the Mazda3 is rising following the arrival of the 105ps 1.5-litre SKYACTIV-D model with CO2 emissions of just 99g/km. Tony Miller, fleet co-ordinator at Coventry-based scientific instruments company Bruker UK, which already counts four Mazda6 and three CX-5 models on its 86-strong company car fleet, drove a number of the marque’s models. He said: “Mazda cars have a good name on our fleet, particularly for their reliability and a style and design that is different from the norm. Drivers start to see Mazdas in the company car park and it immediately prompts interest. One person’s decision to have a CX-5 led to more inquiries about the model - they are the first SUVs we have had on the fleet.